Choose from a market leading selection of cue cases from the top brands. All come with free delivery. Cue cases are essential to anyone looking to take care of their cue, whether for English pool, American pool or snooker, and we offer a fantastic variety of cases from the top brands. All of our cue cases are of the highest professional quality. We can provide you with a range and choice that will be sure to provide you with the perfect case for your needs, whatever you're looking for. We have a fantastic choice of cue cases from a great range of manufacturers. You can take your pick from makes such as Sam, Laperti, Longoni, and Peradon, among others. The two main types of case are soft cases and hard cases. Soft cases are generally cheaper and lighter, and allow you to transport your case with the minimum of fuss. Hard cases are designed to be much more sturdy, though this of course means that they are heavier than soft cases. If you want to give your cue the maximum protection, a hard case is the best choice. We offer a range of cases that are designed for different styles of cue. Some cues are made to be dismantled into two or even three pieces, whereas others remain a single piece even when transported. Choosing a case to fit your cue means knowing your cue and its dimensions. If you're looking for advice on which case would best suit your cue, please call our expert sales team on 0800 622 6464, and we can help you decide which case best meets your needs. All of our cue cases come with free delivery to mainland UK. However, for locations outside the UK mainland there may be an additional charge depending upon your exact location. Please call our friendly customer service team on 0800 622 6464 for a quote. We only stock cases made by expert manufacturers, and crafted using the finest selected materials. Our cue cases are all made by craftsmen, so when you buy a case from Home Leisure Direct, you know you're getting the very best. Visit our Pool Table Showroom to look at a superb collection of cue cases, try them out and get some first hand advice on the right one for you. Our friendly staff are always on-hand to point you in the right direction for your perfect pool cues and other accessories. If you're looking for a new cue to go with your new case, we have over 150 cues in stock, in both American and English styles. 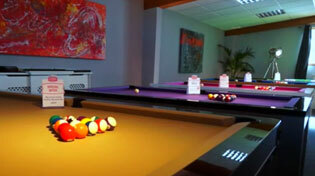 At our showroom you can try out our selection, on any of our huge number of playable tables. We also stock rests and extensions. If there is a particular cue you require, please call us on 0800 622 6464 or 01454 413636 before you travel, as our stock changes daily. If you have any questions about any of the pool cases we sell, or about any of our other products, please give us a call on 0800 622 6464 or 01454 413636 and one of our friendly expert advisors will be happy to help you.